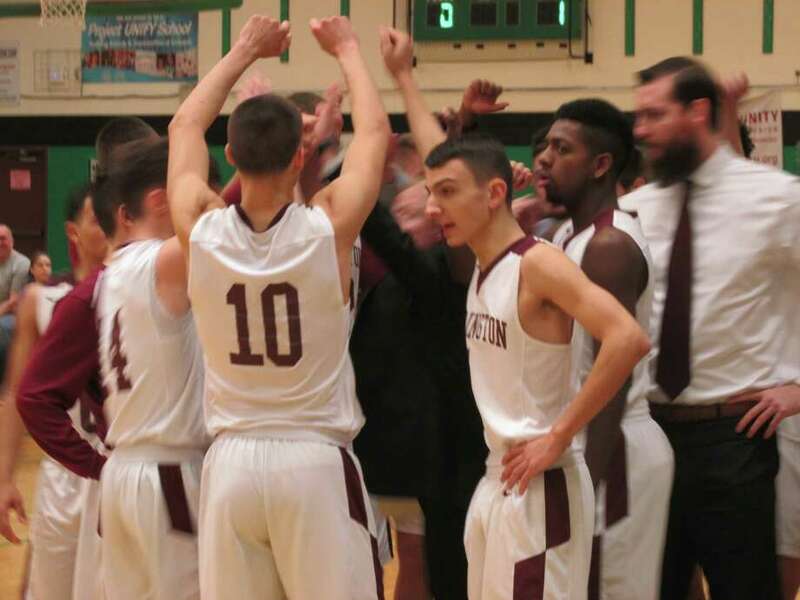 Torrington banded together for a come-from-behind NVL Tournament quarterfinal win over Wolcott Saturday at Wilby High School. WATERBURY — In a Saturday packed with great games in the NVL boys basketball tournament, Torrington and Wolcott opened with different games in each half in Torrington’s 58-56 come-from-behind thriller at Wilby High School. No. 3 seed Torrington and No. 6 Wolcott split their regular-season games. The Eagles edged Torrington 93-87 in a shooting contest at Wolcott High School. The Red Raiders outran Wolcott 57-47 at Torrington. Saturday’s quarterfinal replayed those games in each half. For the first two periods, Wolcott couldn’t miss from outside. All 18 first-quarter Eagle points came from threes, by five different players. Chris Harris (12 points, three 3’s) and Elmin Redzepagic (game-high 23 points, five 3s) added four more in the second quarter, taking the Eagles from an 18-13 first-quarter lead to 36-26 at the half. Locked in a Torrington zone looking sluggish against the Wolcott onslaught, Tyreek Davis, a key Torrington player, went to the bench on his second foul late in the first period, staying there for the rest of the half. “Dismal” was an apt word for Torrington’s outlook. The game changed at the half. “We got energized in the locker room and decided we had to trust one another,” said Thomas. “I spent my time on the bench thinking I had to do something for my team, no matter whether it was scoring, rebounding or defense,” said Davis. Wolcott jacked its lead to 15 points (41-26) in the first minute of the second half on a Brian Perzhilla layup and a three from Jeff Nicol. Torrington coach Eric Gamari stopped the clock, Davis went back in the game and the Red Raiders came out in a trapping full-court press. “We had to speed them up and get them out of the zone,” Gamari said. “We practice for 32 minutes at a time without even a water break. We tire teams out,” said Davis. Joel Villanueva, a Torrington bright spot in the first half with seven of his 16 points, started the Raider comeback with a pair of foul shots. Then a well-rested Davis and the Raider press turned monster in a 13-5 run featuring 11 of Davis’s 16 points; four steals (two each by Davis and Kevin Dixon); and a Wolcott offense suddenly off-kilter on its threes. A final Villanueva foul shot tied the score 46-46 at the end of the quarter. Now, it was another shooting match. Redzepagic and Villanueva offset each other with opening threes; Thomas (11 points) drained a three; Harris drove. Jack Drewry earned a 54-52 Wolcott lead on a three; Davis took it back on another. Thomas hit from the foul line, 57-56, Torrington, 20 seconds left. A would-be game-winning Wolcott three sailed toward the basket…and missed. Thomas grabbed the rebound, drawing a one-and-one foul with eight seconds left. He sank the first one, missed the second, with time for one more devastating Wolcott three. Instead, Torrington’s Davis sprang for the rebound. The game was over. “The truth is, (Dixon) tipped it to me,” Davis grinned. Torrington plays No. 7 Crosby Monday at Wilby in a 5 p.m. semifinal. The Bulldogs beat No. 2 Naugatuck 90-74 in Saturday’s second quarterfinal after the Greyhounds closed a 22-point first-half deficit to seven in the third quarter. But fate and the Bulldogs said two come-from-behind thrillers in a row was too much to ask, even for a tournament as stacked with good teams as the NVL’s. Jeff Nicol 1-0-3; Chris Harris 4-1-12; Dane Hassan 1-0-3; Brian Perzhilla 2-0-5; Elmin Redzepagic 9-0-23; Jack Drewry 4-0-10; Totals: 21-1-56. Dontae Thomas 4-1-11; Tyreek Davis 7-0-16; Joel Villanueva 4-5-16; C.J. Root 2-0-6; Kevin Dixon 1-3-5; Brian Ballesteros 2-0-4; Totals: 20-9-58. 3-point goals: W — Nicol; Harris 3; Hassan; Perzhilla; Redzepagic 5; Drewry 2. T — Thomas 2; Davis 2; Villanueva 3; Root 2. Highlights from RD1-Game 2 of the #ctbb #NVL Tournament:@CrosbyBulldogs Vs Naugatuck Greyhounds. Tyler Spears and Justin Davis scored 22 points apiece as No. 7-seeded Crosby advanced to the semifinals by knocking off No. 2-seeded Naugatuck. Kerin Prince added 19 points. Naugatuck’s John Lukau led all scorers with 27 points. Crosby advances to face No. 3-seeded Torrington in the semifinals on Monday. Jordan Santos 3 0 9 Kerwin Prince 6 7 19 Rahmel Reid 5 0 11 Tyler Spears 9 0 22 Justin Davis 8 3 22 Shakyle Barnaby 0 0 0 Jonathan Rivera 0 0 0 Andre Pierre 0 2 2 Alex Batista 2 0 5 Jose Soares 0 0 0. Totals: 33 12 90. Derrick Jagello 5 1 12 Gwayne Fisher 7 2 16 Andrew Robertson 1 0 2 Keywan Edwards-Garris 2 0 4 Avery Hinnant 2 0 4 John Lukau 9 6 27 Robert Sanders 1 1 3, Justin Barth 0 0 0, Ese Onakpoma 2 2 6. Totals: 29 12 74. 3-pointers: C — Spears 4, Davis 3, Santos 3, Reid 1, Batista 1; N — Lukau 3, Jagello 1. Highlights from RD1-Game 3 of #ctbb #NVL Tournament. Waterbury Career Academy Vs Holy Cross Crusaders. *Side Note*- WCA’s Marquan Watson is A BEAST! Marquan Watson scored 28 points and WCA held off No. 4 seed Holy Cross at the buzzer to advance to the semifinals. The fifth-seeded Spartans will face No. 1-seeded Sacred Heart in the semifinals. Marquan Watson 10 6 28 Lawrence Lazaro 2 4 9 Khalil Simon 3 0 9 Langstun Racine 2 0 5 Jonathan Edwards 4 1 10 Darrell Coombs 0 0 0 Zion Lott 0 0 0 Rafael Prado 0 0 0. Totals: 21 11 61. Akili Evans 3 0 7, Jahvon Myrthil 3 0 9, Qaron Brown 0 0 0, Kyle Moser 1 0 3, Gaely Etienne 5 3 16, Jack Greene 4 0 8, Kyle Lombardi 5 0 14, Alex Ward 0 0 0, Arthur Pappas 0 0 0, Sam Henderlite 1 0 3. Totals: 22 3 60. 3-pointers: WCA—Simon 3, Watson 2, Racine 1, Lazaro 1, Edwards 1. HC—Lombardi 4, Etienne 3, Myrthil 3, Moser 1, Evans 1, Henderlite 1. Jamaal Waters scored 27 points and Nate Tabor had 25 as No. 1-seeded Sacred Heart advanced to the semifinals with a 91-55 victory over No. 8-seeded Ansonia. Alfonso Smith 6 0 13, Martin Antoine 5 0 15, Glenn Hines 3 0 8, Sheldon Schuler 2 1 5, Seth Roselle 6 0 12, John Nimons 0 0 0, Devonte Weaver 0 0 0, Jaylen Johnson 0 0 0, Darrell McKnight 0 0 0, Elijah Ellis 1 0 2, Noah Wagnblas 0 0 0. Totals: 23 1 55. Nate Tabor 11 3 25, Omar Rowe 4 1 10, Connor Tierney 1 4 6, Caleb Sampson 2 0 4, Jamaal Waters 10 4 27, Lorenzo Washington 4 0 11, Tre Duncan 1 0 2, Steve Alseph 0 0 0, Alex Gonzalez 1 1 3, Brady Perrotti 0 0 0, Styles Marshall 1 1 3, Devon Ellison 0 0 0, Oghosasere Igbinewuare , 0 0 0 Hector Alejandro 0 0 0. Totals: 35 14 91. 3-pointers: A —Antoine 5, Hines 2, Smith 1; SH — Waters 3, Washington 3, Rowe 1.